Then he went about among the villages teaching. He called the twelve and began to send them out two by two, and gave them authority over the unclean spirits. He ordered them to take nothing for their journey except a staff; no bread, no bag, no money in their belts; but to wear sandals and not to put on two tunics. He said to them, “Wherever you enter a house, stay there until you leave the place. If any place will not welcome you and they refuse to hear you, as you leave, shake off the dust that is on your feet as a testimony against them.” So they went out and proclaimed that all should repent. They cast out many demons, and anointed with oil many who were sick and cured them. Mark 6:1-13. 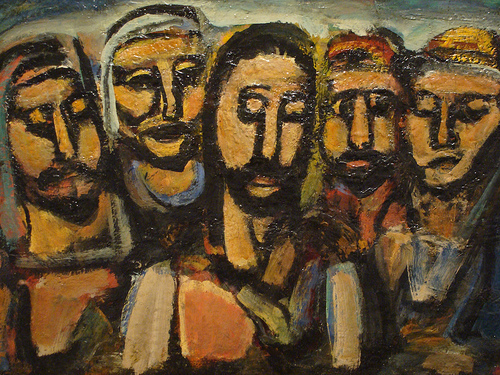 Mark’s Gospel for the Sunday Lectionary offers us several insights into Jesus. You may remember a couple of weeks back, as the disciples were caught in a terrible storm, they wondered, “Who then is this, that even the wind and the sea obey him?” Mark 4:41. Last week, in Chapter 5, we heard a partial answer to that question, in the stories of Jairus’ daughter and the woman who touched Jesus’ cloak. I think today’s reading may also help us unlock the answer to that question. Often, I think, we lose the irony of Mark’s next phrase. “And he could do no deed of power there, except that he laid his hands on a few sick people and cured them.” Most of us would probably find such a miraculous hearing sufficient, if not extraordinary. Like their Rabbi, the disciples would not travel with either pomp or plenty. They travelled, as Jesus did, sharing in the people’s need and vulnerability. The twelve would learn to abandon the illusion of self-sufficiency. The disciples would have to learn to trust God’s people, to trust each other, and most importantly, to trust God. They would learn to be the instruments of grace and faith, and learn to be the music those instruments played. Through the Incarnation of this Jesus, they would learn what the Kingdom looked like, and learn that God wanted to bridge His separation from mankind. Throughout their time with Christ, they would begin to understand the answer: “Who then is this, that even the wind and the sea obey him?” I hope we begin to understand, too. Lord, we believe; help our unbelief. This entry was posted in Uncategorized and tagged Anglican, Bible, Disciple, Bible, Christianity, Disciples, discipleship, Episcopalian, Gospel of Mark, Incarnation, Jesus, Mark 6:1-13, Religion, Scripture, Spirituality, The Kingdom of God, Theology. Bookmark the permalink. Excellent post Bro. James. I believe miracles happen when we begin to trust God. I’m so glad you liked it. I share your believe. Jesus said: “The Son cannot do anything by himself – he can only do what he sees the Father doing” (John 5:19). When Jesus took part in healing another, he was always in the presence of desire and faith. The leper in Matthew 8:1 said: “Sir, if you will to do so, you can cure me.” The centurion whose son was paralyzed said: “I am not worthy to have you under my roof. Just give an order and my boy will get better” (Matthew 8:8). At Capernaum, Jesus witnessed the faith that healed the paralyzed man (Matthew 9:2). The woman who had suffered hemorrhages for 12 years sought to touch his cloak having faith that she would get well and Jesus said: “Your faith has restored you to health” (Matthew 9:21-22). When the crowds of Gennesaret saw him arrive, so great was their faith that they brought their sick to anyplace Jesus appeared and “all who touched him got well” (Mark 6:53-56) (The New American Bible, 1970). When he approached the sick, Jesus asked them: “Do you want to be healed?” (John 5:6). He asked the two blind men who sought him: “Are you confident I can do this?” They responded: “Yes” and Jesus said: “Because of your faith it shall be done to you” (Matthew 9:27-28). In Jericho, Jesus asked the blind man who had been calling out to him for pity: “What do you want me to do for you?” The man answered: “I want to see.” Jesus replied: “Your faith has healed you” (Mark 10:47-52) (The New American Bible, 1970). At the synagogue in Nazareth, though, Jesus “could work no miracle . . . so much did their lack of faith distress him” (Mark 6:5-6). Even Jesus could not help those who did not believe they could be healed (The New American Bible, 1970). I cannot thank you enough for your thoughts, and yes, I’m convinced this is a subject you should blog on. I remain convinced that faith opens our eyes to God’s work in the world. “The twelve would learn to abandon the illusion of self-sufficiency.” love it! I’m so glad you did. Thanks so much for the grace of your support and encouragement. Good post brother James. If the disciples at this time knew him as a man hence the questions about his power. After Pentecost they knew him as God. I think this would answer the questions that you have presented. God or our faith? Since we know him as God, the power and ability is his always. Hence we carry nothing. our faith totally in him as one who can do the miracles, do all the miracles. You are, as always most welcome. Learning to “take nothing for the journey” challenges me deeply. It’s one of the places I need to grow. Bro James. I really appreciated you statemnt concering Mark’s observation … “Our trust in God opens our eyes to the everyday miracles that surround us.” . I totally agree with you. God’s powerful workings are not limited by the amount of faith that we oossess. It is our recogniztion of the=ose miracles that are limited by the strength of our faith. As always.. thank you for a very interesting study. Thanks so much for your thoughts and your encouragement. I think we have to regularly struggle to avoid visions which would limit God. And, you’re most welcome.